Last Sunday, December 8, I woke up to the familiar sound of excited voices. In my living room were my three grand-children, hardly able to contain their enthusiasm about their plans to help the survivors of Yolanda. 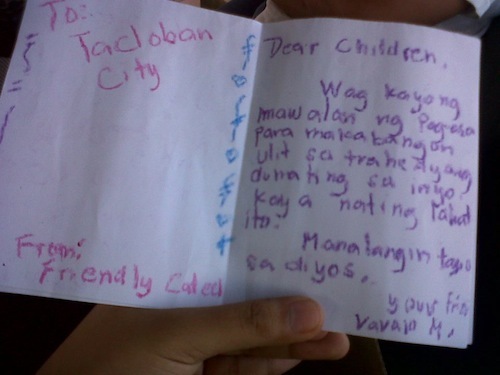 Leading the pack was 6 year old Chloe holding a cardboard sign which said "will cartwheel for P100 donation to Visayas." Her older sister Ariel sells her paintings for P500 each, three year old brother Wolfgang sings his favorite One Direction song for donations - together they want to raise P125,000 for a home in the Human Nature Village that their parents are hoping to build for 100 families next year. Happily, I lost my entire cab fare and allowance to go to Cebu later that day to the three disarming GK crusaders but gained the most exhilarating affirmation from their generosity of spirit - that our sacrifice for others will benefit those closest to our heart. Every effort makes a big difference. Chloe and Ariel give their time and talent to help rebuild Visayas. Christmas is about giving and counting our blessings and wishing only the best for the people that we love. Seeing my children raise their own family, there is no doubt in my mind that the best Christmas gift I have given them is Gawad Kalinga, where giving is a day to day expression of unconditional love... and our constant source of joy. The more we love, the more we give. The more we give, the happier we get. When we consider the poor as family, our heirs will inherit a country where no one is poor, where wealth creation will be inclusive and done with justice and fairness in a "walang iwanan" economy that leaves no one behind because everyone is his brother's keeper. GK caretakers and volunteers sacrifice time, talent and treasure not only out of compassion but as a common sense investment in building a kinder, fairer and safer world for their children and a country rising out of poverty and corruption that they can be proud of. The act of giving is a conscious personal decision to love others beyond self. To GK Executive Director Luis Oquiñena, it is very personal. He cares for the children in calamity and conflict areas with the concern and urgency of a father who has expanded his definition of family, attending to the needs of the homeless and the hungry as equally important to providing shelter and food to his three biological sons. For treating the poor as family, Luis was awarded by Skoll World Forum as the Social Entrepreneur for 2012 and this year's Civic Hero by Rappler, a social media group. By being a blessing to others, we receive much more in return. We give hope, build peace, receive trust. We discover the power of kindness to multiply loaves and fishes, to make us walk on water and to turn swords into plow-shares. After 10 years, GK has become bigger and stronger because more and more people are moved to acts of heroism and generosity as a deeply personal calling. Beneficiaries take on a "pay forward" mind-set, CEOs make it a personal commitment beyond CSR. This particularly includes those serving generously and unselfishly in the GK Board of Trustees who carry great responsibilities and busy schedules but remain faithful and steadfast in their personal commitment to our work of nation-building. Sacrifice for others who have less is their personal act of gratitude for achieving so much in life. In GK, every day is Christmas - a daily act of giving and receiving and giving back. Any day, somewhere in the Philippines, a GK home is being built, children are mentored, trees are planted, medical missions are conducted, jobs are created. The Kapitbahayan (residents) of GK Sulangon in Dapitan City, Zamboanga del Norte raise money for the rehabilitation of areas affected by Typhoon Yolanda. "Nung kami ay nangangailangan, kami ay nabiyayaan. 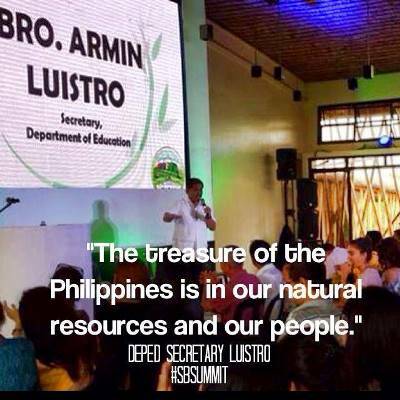 Kami naman ang handang tumulong sa iba sa ganitong paraan." Today, many see Gawad Kalinga as a Filipino brand of nation-building, anchored on our bayanihan spirit of caring and sharing. With a clear vision and a strong determination to help end poverty for 5 million Filipino families by 2024, many are joining the bandwagon of nation-building. Maybe it could be the Filipino dream that many are looking for. Or just the brand of trust in this age of Napoles where simple folks dared to rebuild lives through sweat and sacrifice and not on a funding mentality. GK is our response of good citizenship to match the sincere and extremely difficult effort of our President to forge a "daang matuwid" through a crooked and corrupted culture, built over the years by bad leadership and greed. Within our current context, the best Christmas gift we can give to our country is simply to be honest ourselves - not to cheat on our spouse, business or taxes - and not to neglect society's rejects by giving our best to the least to help an entire nation rise from the bottom-up. The gift of honest leadership from the top and our simple gift of self to those at the bottom of the pyramid will be a blessing to future generations beyond 2016, as 50 years of corruption is a curse that we are purging from our society today. Our act of honest giving at home is catching attention and inspiring similar efforts abroad. The global community responds with an outpouring of generosity. 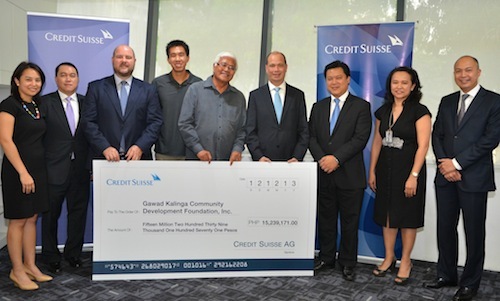 Credit Suisse Singapore gives ~PHP 15M to Gawad Kalinga for Typhoon Haiyan (Yolanda) reconstruction efforts. While Gawad Kalinga operates massively locally, it has also gained global credibility. The Indonesians are using it as a template to address poverty in 4 areas in Jakarta. Australians are seeing its potential in improving the quality of life in aboriginal communities. The French and other Europeans see GK as a massive economic platform for social entrepreneurs in Asia and a destination for an immersive cultural experience. Doing well while doing good is the buzz word of the young and the growing mood of the new market. The recognition given to GK in the last three years speak for its relevance and urgency today. Reader's Digest's most trusted in the Philippines; Japan Nikkei's Regional Community Leadership awardee; Social Entrepreneur of the Year - Ernst & Young, Schwab Foundation, Skoll World Forum, World Entrepreneurship Forum. By humbly giving hope to the least - like the star that shone in the East - we received honor and trust from the highest award winning bodies in the planet. Now we can help more people because more people trust us. With every calamity, we gain more trust from global corporations and organizations as the channel for relief and reconstruction because in many areas our GK communities are the natural distribution centers and our residents are the eager volunteers on the ground. The typhoon Sendong and Pablo beneficiaries in Iligan City, CDO, Davao and Compostela Valley are now our volunteers for Yolanda in the Visayas. With great trust comes the greater responsibility to deliver and be more accountable. Next year looks more challenging - and exciting - with our goal to raise 1 million volunteers to build 20,000 homes and inspire the world to find the funds to build them. In faith we will build and they will come. Another source of excitement is the economic platform for social education, social business and social tourism in the GK Farm Village Universities that we hope to build in 25 sites nation-wide by 2024, with the GK Enchanted Farm in Angat, Bulacan as prototype. At present, there are 21 social business brands that are being incubated and 80 more that will be started, with support from top universities, big corporations, national government agencies and the local government units. The K12 pilot program for social entrepreneurs will start at the Enchanted Farm next school year in partnership with the Department of Education. This is a mind-boggling milestone for Gawad Kalinga and our partners. "We target that by June 2014, the first Social Enterprise school will be running inside the GK Enchanted Farm." To end poverty, we will develop the creativity and entrepreneurial spirit of the next generation; to create wealth and generate jobs at home - not simply seek jobs abroad and to produce the best quality local products - not just import expensive or inferior foreign brands. Everyday is Christmas for those we shelter and empower through education and job creation. 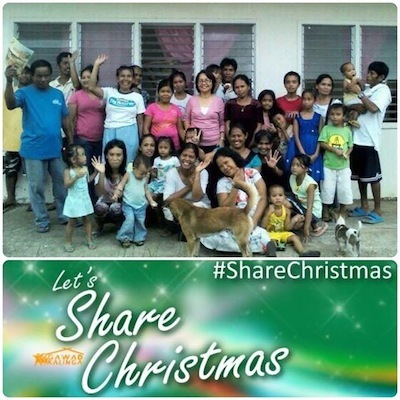 Everyday is Christmas in the home of those who raise their children to care for others. Chloe did 34 cartwheels that day at home, in church and the concert she went to in the evening and raised P3,400. She still needs to do 1,216 cartwheels to reach her goal. She is now accepting on-line donations.